Arieana Arabians is a small but highly selective Arabian Horse breeding program in Southern California dedicated to preserving the legacy and heritage of the wonderfully versatile CMK Arabian horses from the breeding programs of W. R. and Austine Hearst Jr. and Harry and Katherine Harness. Our goal is to produce naturally soft-gaited purebred Arabian horses suitable for riding and specialty work within the Arabian Racing or Arabian Sport Horse disciplines while still maintaining the willing temperament and kindly disposition so necessary for family pleasure use and companionship. Our motto: "A pleasure to own, a pleasure to ride." We value our legacy. We breed from Hearst/Harness derived bloodstock when and if possible and in as high-concentration as practical. We strongly believe these horses will continue to breed-on with the same desirable qualities, style, and elegance of the purebred Arabian horse who inspired us to begin this joyous journey when he came into our lives 33 years ago ~ our cherished gelding Ashan Adar AHR #103929 (Smoky Rahmoun x Rahmouns Bamboo by Rahmoun) pictured above. Following the Bedouin tradition of honoring pedigrees by their tail-female descending lines, we cherish our Hearst-bred Foundation Mares Gleeful Pico and Haapey Pico with their linebreeding to the desert-bred mare Ghazieh and her descendants. 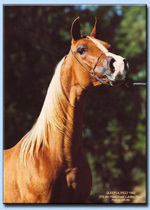 By carefully selecting stallions to compliment their traits with similarly-derived Crabbet-Maynesboro-Kellogg bloodlines, along with incorporating where possible the descendants of horses from Mr. William Randolph Hearst's Importation of 1947 and the breeding program of Harry and Katherine Harness, the foals of Arieana Arabians hold promise to breed-on true in their own images and proudly carry forward the honors and traditions of their Old California/CMK Heritage. We are excited about the future. We eagerly look forward to watching the foals we have bred as they mature and develop under the guidance and care of their new owners. Our attention is currently focused on the rising star Haat Pursuit, the Arieana-bred stallion in which we take such great delight for his promise and potential as an Arabian Sport Horse Supreme and future herd sire for Tim and Kristi Johnson, D.V.M. and their Hearst Importation Preservation project. Thank you for visiting us here at the website home of Arieana Arabians. 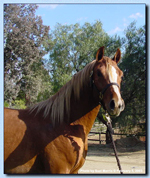 We hope you will enjoy your browsing through our website and then return often, for more is planned and will be continually added as we go forward with Arieana's CMK Heritage Notebook, a special section of articles and links on The Original Racehorse, and our Southern California CMK Heritage News. Copyright � 2003-2015. Website designed and maintained by Suzi Morris and all rights reserved. 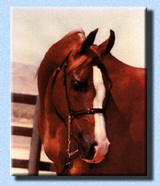 This page originally created for Arieana Arabians Summer 2003. Updated and Current as of June 19, 2015.